Murata Manufacturing Co., Ltd. (株式会社村田製作所, Kabushiki-gaisha Murata Seisakusho) is a Japanese manufacturer of electronic components, based in Nagaokakyo, Kyoto. Honorary Chairman Akira Murata started Murata Manufacturing as a personal venture in October, 1944. On December 1950 reorganized the company into Murata Manufacturing Co., Ltd. with paid-in Capital ¥1 million. As of March 31, 2013 Murata Manufacturing has 24 subsidiaries in Japan and 52 overseas in the United States, Canada, Mexico, Brazil, Germany, France, Italy, the United Kingdom, Switzerland, the Netherlands, Spain, Hungary, Finland, China, Taiwan, South Korea, Singapore, Malaysia, the Philippines, Thailand, Hong Kong, Vietnam and India. 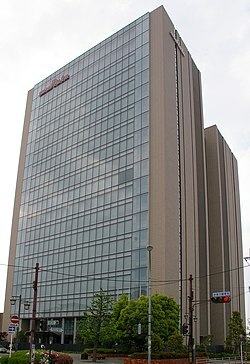 On April 13, 2012, Murata announced a deal to acquire RF Monolithics for $1.78 per share. On August 23, 2014, Murata announced the acquisition of Peregrine Semiconductor Corporation. On July 28, 2016 a Memorandum of Understanding was signed between Murata and Sony announcing the intent to sell a portion of the latter's battery business (Sony Energy Devices Corporation). In October 2017, Murata announced sponsorship of an exhibit in the Epcot theme park at Florida's Walt Disney World. Entitled The SpectacuLAB, the science oriented presentation emphasizes STEM themes in support of children's education. Murata has a variety of electronic products ranging from communication and wireless modules to power supplies. The company is also very famous for manufacturing lumped components and RF filters based on different processing technologies like thin-film, thick-film, and LTCC (Low Temperature Co-fired Ceramics). This includes monolithic ceramic capacitors, multilayer ceramic devices, chip inductors, SAW filters, crystal filters, LC filters, ceramic resonators and many more. Murata conducts a lot of research on new technology related to RF components. Usually, the outcome of these research is published through patents. For example, Murata holds more than 300 patents and patent applications for technology related to ceramic capacitors. ^ "Corporate Overview". Retrieved July 31, 2014. ^ "Company Chronology". Retrieved July 31, 2014. ^ "Corporate Network". Retrieved July 31, 2014. ^ "Murata to buy RF Monolithics". Compound Semiconductor. April 17, 2012. Archived from the original on July 14, 2014. Retrieved July 31, 2014. ^ "Murata to Acquire Peregrine Semiconductor for $471 Million". everything RF. Retrieved August 25, 2014. ^ "Sony says to sell battery business to Murata Manufacturing". Reuters. Retrieved July 28, 2016. ^ "Murata presents The SpectacuLAB at Innoventions® in Epcot". Murata. Retrieved October 18, 2018. ^ "Patents Assigned to Murata Manufacturing Co., Ltd". patents.justia.com. Justia Patents Search. ^ "Stacked Bandpass Filter". patentscope.wipo.int. ^ "Laminated band-pass filter having an even number of LC parallel resonators". 27 October 2009 – via google.com. ^ "Murata Boy". Retrieved July 31, 2014. ^ "CES 2011: murata boy + murata girl robots". Designboom. January 11, 2011. Retrieved July 31, 2014. Wikimedia Commons has media related to Murata Manufacturing Co., Ltd..